The latest theory put forth by Detective Daniel Cunningham of the SFPD — the officer currently working on Patty Vance’s cold case — is that Patty was killed as an act of revenge. He told me when we last spoke on August 15 that Patty had gained a reputation for robbing people. Cunningham, or Detective C as I’ve started to refer to him as, believes that Patty picked the wrong person to steal from, and it cost her her life. So much for my theory that she was murdered as a result of working at one of the most dangerous jobs in the world. I chalked up Patty’s MO for stealing to drug use. I probably said this a little defensively, as if Detective C hasn’t had a ton of experience with this sort of thing. Of course he has. I basically implied that it wasn’t her fault she was stealing from people; that’s what having an addiction issue with drugs just does to a person. He agreed with me. “That doesn’t make her a bad person,” I remember him saying. This was confirmation that he knew exactly how drug addiction worked. Detective C was convinced that it was someone who knew Patty already. That sounded convincing. Clearly he’d put a lot of thought into this. All I can hope is that Detective C’s “looking into things” will actually result in some sort of action, some sort of justice. What I can’t stomach is the lack of justice. 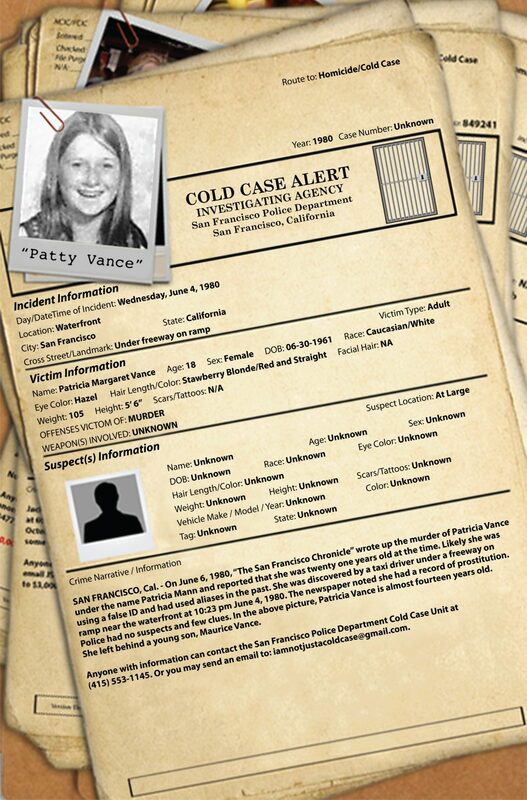 I am still hoping to win for Patty the cold case lottery.